Its not just the war on opioids that is the cause, but some studies that have been done that have tipped the scales. These studies show that patients with chronic pain who have used opioid pain pills long term have been shown to not improve in their pain level and that sometime their pain even worsens. Wow! Imagine that! A pain pill that is not supposed to cure anything in the first place, didn’t! I am so shocked! Who comes up with these studies anyway?! Pain meds were never suppose to heal the body of illness or injury, whether chronic or acute. Pain meds are used to make a patient comfortable! Pain meds are there to make their quality of life better, whether for a short time while their body mends, or for the long haul so that a person is not in more pain than necessary. People that have chronic pain are now facing the prospect of having little to no resources to ease their persistent pain. Living in chronic pain without pain meds when you need them is a prison sentence. You are living but you don’t have a life! Not all people who use opioids are addicts. For many it is a life line: a means to work, to socialize, to gorcery shop, to play with your kids, a way to have some normalcy, to regain a part of yourself for a little while, the you from before your chronic pain went and changed everything. I know there needs to be ways to assure people don’t abuse these drugs and the system, checks and balances, but it can’t be at the cost of peoples lives. If this blog makes it around by some miracle to the people who make policy, politicians making these big decisions, perhaps all pharmacies have a network and IDs are swiped whenever opioid are picked up so that abusers cant go and get various prescriptions filled from multiple doctors (that is a thing apparently.) It is already in place a believe for certain OTC drugs that can be used to make other illegal drugs. We could extend the same principle and make it so that people can only get pain meds from one authorized doctor at a time. (Its an idea anyway, a work in progress. Doctors: can we be open and honest with one other, without judgements. Yes, we often are seeking drugs. No, it is not to abuse them but to try to salvage some sliver of normalcy in our lives. We want to be useful and maintain a little dignity! I’m gonna flip the tables a little. You break your leg and go to the ER. They do X-rays, possibly surgery, and place the hurt limb into a cast until the bone can mend. What else? They are sent home with pain killers! But wait! I thought option pain killers were dangerous and should be avoided at all costs. Why is this type of situation different? Maybe a better question would be, why do doctors treat these situations differently? We know that with anything in the body that needs to mend or heal, the body can do so within 3-6 months. It doesn’t take any longer than that, and this is the demarcation line between acute and chronic pain. These terms have nothing to do with severity of pain but with how long it lasts. Now if someone who is in chronic pain (remember that’s 6 months or longer) can be expected to just accept their pain, why are these same pain meds given so freely to acute pain patients (i.e. Broken bones, surgery recovery, kidney stones, etc.) Their pain will last 6 months tops so why can’t they just tough it out? Because we don’t want people to suffer unnecessarily! Now then the real question is, why is our suffering, that of those with chronic pain, different? What happened to do no harm? Are we not people too, who deserve to have our suffering eased when possible, especially since we have so much more pain, even the definition of chronic pain demands that we have already suffered longer! Why do we just have to accept it?! There has got to be a better way forward! How do you feel about the war of opioids? How has it affected your life? YES, I am tired. I am tired in more ways than I can count. It’s almost 4:30 am and I haven’t got to slept yet for several health reasons and because I over did it which I will pay for tomorrow, I mean later today, tomorrow….. today?? I am tired but can’t sleep, but look out, because when I finally do sleep, I will crash for 12+ hours and be a wreck for the remainder of the day. The point of this is not: woe is me! Plenty have it much worse. I am blessed in so many other ways. The point is, if you see me out of my house you would not know how “tired” I am. You won’t see the pain and sleepless nights and the frustration at feeling dumb because of fibro fog. In trying to make the most of my situation and stay positive, a lot of the aspects of my illness become invisible. Like those with “invisible illnesses,” you usually are not gonna see the full extent of what someone is carrying around on their shoulders,…….. so……. so what? SO!!!!! be kind to one another! Even if someone seems rude, or impatient, angry, inconsiderate….. we never know which battle field someone has just left. Maybe they won…. maybe they lost. Maybe they are in the battle right now! So be kind! Don’t get me wrong. We shouldn’t use our battles to act badly intentionally. But grace and kindness to our fellow man goes a long way. Grace because we have all acted badly now and again, and kindness because that could be the support someone needs to keep fighting! Grace and kindness, people. Grace and kindness. I’m sure you’ve already heard something like this before….. yet with so much negativity, animosity and full on hatred and self centeredness going on throughout so much of today’s society, I think it bears saying once more. But they cut in front of me! It doesn’t matter. But!??! No, it doesn’t matter in the long run. My illness is invisible. My battle is invisible. We all have our battles. Even if you can’t see someone’s battle, that doesn’t mean they aren’t fighting for their lives. Lady Gaga recently told the public that Fibromyalgia is the chronic pain illness that she has been dealing with in recent years. As I read through some of the comments, I noticed that most of them said “get well soon!” Now these comments are sympathetic and well meaning in nature, but they also show that there is a common misconception about this disease. It is not a cold that will pass or a broken bone that will heal. There is no cure for fibromyalgia. It is a disease that one must wrestle with for the rest of their life. But it doesn’t stop there. I was recently reading a blog about this same announcement from Lady Gaga, and the comments that this writer found were of a very different nature. Not only were these comments harsh, but they were down right mean and hostile, insinuating that she was either faking her condition for attention , or blowing it out of proportion, because how could she do the things she does if it was that bad? This is so saddening on so many levels! So why is Fibromyalgia so misunderstood? What is Fibromyalgia? Is it even real? Yes, Yes, YES! Fibromyalgia is real! Not only is it real, but it’s been around for over a century. But don’t take my word for it. In 1992, the World Health Organization recognized it as real and included it in its report on the classification of diseases (more precisely, the 10th Revision of the International Statistical Classification of Diseases and Related Heath Problems.) So why does it seem like it is a relatively new disease? Perhaps even a made up disease to validate hypochondriacs and get them out of the doctors office? Well, have you ever heard someone refer to having rheumatism? They will probably be from an older generation and the reason for this is that Fibromyalgia has had several names over the last century and only been known as Fibromyalgia Syndrome since 1976. Now admittedly my info on the previous FM names (Rheumatism and Fibrositis) previously came from a book that did the leg work for me in terms of research and connecting the three names to the same illness. How do I know this to be true? Well the research of a doctor much more learned than myself, and if that was not enough, the WHO also classifies Fibromyalgia, Rheumatism and Fibrositis as one and the same in their report on disease classifications. Okay, so if this is a real disease, then why all this confusion? At least partially to blame, in my opinion, is that many doctors don’t seem to have a sufficient handle on the condition. For instance, every accepted theory on FM that I have come across, agrees that FM is not inflammatory or autoimmune in nature, yet my GP did not know this, and tried to explain a high inflammatory marker on FM. What?! Part of diagnosing FM is ruling out other possible diseases and how can any doctor do that unless they know what it is and what it is not. Now why these board certified doctors don’t understand widely accepted aspects to a disease that affects millions of people is beyond me. Guess they are able to swept it under the rug of practicing medicine and move on…oh vey!?! Now if the medical community has a deficit in its understanding of FM, then think how vast that deficit is throughout the general community. Goodness knows, renaming a disease, not once, but TWICE, will also have its own negative effects on public awareness, but the commercials for FM drugs don’t help either. “Fibromyalgia is thought to be cause by overactive…” Yada yada. The thing that is introducing most people to this disease is also instilling the thought that we don’t know anything about it but here, buy our drugs! Little disclaimer, I couldn’t find a poll listing how people first heard about FM, but I think it is safe to say, or it is my opinion at least, that how ever the public has been introduced to FM it was not in an educational or effective manner. The reason I say this is because so many seem to (a) not know what it is at all, (b) think it is a fake/wastebasket diagnosis or more mental in nature, or (c) think it is no big deal and we all are just complaining or looking for attention. Most individuals that have any real idea of what FM actual is, are either themselves suffering from FM or is close with some one that is. Now the controversy over Fibromyalgia seems to boil down to a lack of knowledge and compassion that leads to various forms of doubting FM sufferers. It’s okay to to not know about something. Gracious! In all my education, the biggest thing I learned was how much I don’t know! Friends of mine have not always known what FM is but because they are compassionate people, they asked about it with an open mind, willing to learn! The problem is not having all the facts and calling someone a liar or a fake. The problem is telling someone there pain doesn’t matter or that it can’t be real, that it must be in their head. The problem is not caring enough to try to understand. And believe me, doubting those in pain is a problem! It’s bad enough to be in chronic pain, or have a chronic illness. It is even WORSE to have to prove it to people that it is a debilitating problem. Can you really say that 2-4% of the population is actually only imagining that they are sick? It is said that roughly 10 million people in the US suffer from Fibromyalgia, but then I guess we are all just confused, right? Wrong! Science and medicine have yet to prove exactly what causes fibromyalgia, but that does not disqualify it from being a valid medical issue. Nor is it disproved due to the current lack of a definitive diagnostic test. The medical validity of migraines are not questioned yet their cause is also unknown. There is no test that is done to prove that you have experienced a migraine nor how bad its severity, yet migraine sufferers are not questioned like they are on trial. So why the double standard? As the CDC reports on its website, “Fibromyalgia can cause pain, disability, and lower quality of life…If you’re a woman with fibromyalgia you may have 40% less physical function and 67% less mental health.” And that’s not even all of the possible complications. Yet on the same page it also claimed that “Fibromyalgia can be effectively treated and managed with medication and self-management strategies.” Maybe I expect too much, but a 40-67% decline in my overall health doesn’t seem very effective to me. I hope it is clear why there is so much confusion about FM and sometimes even heated controversy. Now, if you will indulge me, I’d like to share some of what I have learned about FM theories, treatment options and some other thoughts. I have struggled a lot over this post, writing and re-writing and debating how in depth to go…. I’m gonna tell you about the main theory which is used by probably the majority of the medical community, and the theory that my FM specialist has cultivated across approx 55 years personal research and observations. OF course, there are all the holistic approaches that can encompass either just the way to health or cause and cure. For so many of these people, gluten free is the way, or anti-inflammatory diets, or any one of dozens of new fad health crazes which all promise to cure you of anything from the common cold to cancer it seems……I digress but I will not include any of these holistic approches, because one, who’s got time for that?! And two, regardless of the illness, it seems that these approaches are kind of self explanatory anyway… okay, so here we go. Thankfully there is another theory, and this one comes with a treatment plan that works not just to manage symptoms but to actually reverse the diastase itself. 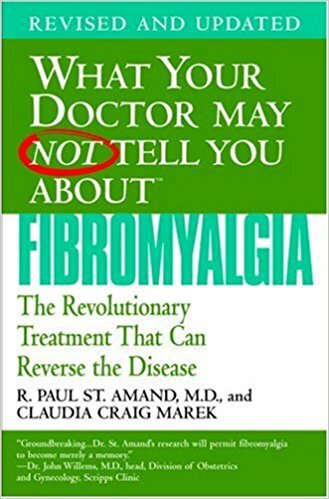 As I mentioned in my previous post, I was introduced to Dr. Paul R St. Amand, whose work in the field of Fibromyalgia spans decades and whose observations led not only to a plausible theory but a treatment protocol that has helped thousand of patients (if not tens of thousands) reverse the debilitating symptoms of Fibromyalgia and truly manage this lifelong disease! This theory of St. Amand’s is the culmination of almost 60 years in the field, or rather, the trenches, of Fibromyalgia. You see, Dr. St. Amand and many in his immediate family also have fibromyalgia, so it is easy to see why he would have such a personal stake in finding real answers. Back in the 50s, before the term Fibromyalgia was even coined, St. Amand observed among his patience that “there existed a prevalent, unidentified, unexplored, but very real disease.” After one thing and another, St. Amand started to treat these patients with gout medicine to help the body expel the build up that was causing system wide havoc. Gout meds do come with side effects so in the 90s he switched to Guaifenisan and it has proven to be just as effective and has no side effects! The best part of this protocol is that there are patients that have been following it for upwards of twenty years and they are still living full lives. The treatment didn’t help for a bit then leave them hanging after a short respect, and the reason for that is that this treatment address the issue at hand not just the symptoms. If you don’t need want to read an entire book, you can go to this doctor’s website to read countless success stories from is patients. An aspect that also sold me on his theory (other than it just made sense) is that St. Amand does not have ulterior motives, he simply wants to make people feel better and to find out more about the disease so that it can be fully understood and hopefully easier to diagnosis and treat in the future. You see all money made from his practice (that is not used to keep the lights on) goes to fund research that is being conducted at City of Hope on FM, and his book tells you all you need to know about his treatment protocol so that those who are unable to see him to still benefit from his protocol! The medicine used is over the counter thus no incentives for him except to see his patients succeed. St. Amand has treated over 10,000 patients in his decades of practice and cares about you getting your life back. Fibromyalgia is a very real, and often, very debilitating disease that can completely over take your life. Only one option even claims to reverse this disease in its tracks, the others are just proverbial band-AIDS that may or may not help. So even though St. Amand’s protocol is not for the faint at heart and not widely accepted, why not do both? Try to reverse the disease AND do what you can to ease your symptoms in the mean time? Even if it is just a Hail Mary, can you really afford not to take a chance with it? Can you afford to not seek out and try every available aid? Because this is not a game, it’s your life. The quality of your life with your family, your relationships with friends and coworkers, your ability to do beloved hobbies and daily chores. Are you really willing to gamble all of that? Most of you know me from one job or another. Others, I had the pleasure of sharing the stage with or perhaps a class at school. Still more from church. I was that waitress who sang for your brother’s birthday, or helped you with your homework, or that you would watch yet another Harry Potter or Star Wars marathon. I was always up for an adventure and a cheesy joke (particularly if it was Gouda…..and yes, I went there!) I worked as a senior rep doing finance, had my own apartment, vacationed, would go to both live performances and the movies whenever I could, and was blessed to be doing paid music gigs on the regular. But while that is who I used to be, it is not who I am now. About ten months ago I got a migraine. Now this was not by any means my first headache or even migraine. While I may had been familiar with headaches at this point ,they were not so frequent as to put me in the Chronic category, or so severe that I would even think of going to the doctor. Day 4 of the migraine came and went and still no relief. Then day 5 and 6 at which point I got my GP on the phone for help. She gave me a course of steroids to stop the migraine, anti-nausea meds to help with that lovely bi-product, and a preventive med for the future. I had a vacation already scheduled to visit family so I picked up my new and varying prescriptions and crossed my fingers that western medicine and a week away from work would fix me up. I’m sad to say that it didn’t. I soon became a regular at my doctor’s office. This med, that shot, all the labs and scans you can imagine, chiropractors, acupuncturists, infusions. Some meds made me a zombie, others made me just plain stupid (how do you do basic subtraction again…) but they all had one thing in common; none of them worked. I missed work, holidays, birthday and going away parties, and on and on. All this time the headache continued and now I was having back and hip pain which left me unable to walk without a limp and unable to be on my feet for much more than 15 minutes. I didn’t know what was going on with me or even if my symptoms were related to one another. I was physically and emotionally drained, still in pain, and didn’t know what to try next. Then in late January of this year, God sent me an angel! After telling me about herself and her medical journey as a whole, Salena, aka my angel, asked me if I had ever heard of Fibromyalgia. I tried to be polite as I replied that I thought it was the made up disease that doctors gave out when they couldn’t actually find anything wrong with a patient. After laughing, she kindly educated me on the basics and explained her doctor’s theory on what he believes cause Fibromyalgia, or Fibro for short, and the symptoms that he ascribes to Fibro, and his treatment protocol developed from decades of working exclusively with Fibromyalgia patients. Before long I had an explanation for all the weird, random and often very troublesome health issues I had been dealing with for over twelve years!!!!! I will wait for another time to go into the specifics of Fibro and my past health issues, but for now all you need to know is that I had been in a miserable way. But now, Not only did I have a plausible explanation for my pain, but an actual treatment was available. That very night I tracked down the book written by this doctor and read it cover to cover. The next day I called and made an appointment to with this doctor for later in the week, then all there was left to do was wait. But the fear and dread started to creep in. What if I saw this doctor and he too said he could find nothing wrong with me? Fibro fit all my symptoms but what if he didn’t confirm the diagnosis? What then? I was so hopeful but so afraid too that this would be just another dead end. Well, after a very long three days, I had my appointment and to my immense relief, a confirmed Fibro diagnosis! Now it was time to start getting better. This doctor’s treatment is not easy nor is it a quick fix. I have been on it for about seven month’s now but still have a long road until I am fully functioning human again but I can say that I have seen some progress. I don’t know if it will be weeks, months or even a year before I am “better” but just have to remember to be patient since everyone responds differently and in their own time. While I continue this doctor’s treatment protocol, as well as a few others just to be on the safe side, I am hopefully that some day I can get back to my old self, but I am still in pain everyday. It has been ten months now of daily headaches and other pains, fatigue, GI and skin issues as well as sensory overload to things like light, sound, smells, and even crowds sometimes. My life has been turned upside down by Fibromyalgia. If I do go to the movies, it’s with ear plugs. I have to turn down gigs because it hurts too much when I sing, my brain is too fuzzy to remember lyrics, and I don’t know if I can stand for the length of time required for the gig. I now have to keep my driving to within an hour driving radius, my trips to the grocery store under a half hour and often have to cancel social plans. There are days I can barely get out of bed and I often don’t leave my house for days at a time because of pain and extreme fatigue. In March I went out on disability as I was no longer able to cope with the workload and just a month ago, I made the tough and emotional decision to give up my apartment and move back home with my parents. So to recap, I have no job, I live with my parents, don’t perform, and avoid things I used to love because its just too much hassle with my current health issues draining all enjoyment from them. This is not to have a pity party or to make you feel sorry for me. This is my reality, at least for now, and I want to make it count. This new chapter is just that and I am determined that future chapters will soon start to include more of the things I love that have been missing as of late. But in the meantime, this is my reality, and I want to do more than just survive. Now I have learned some life lessons in my time and here are a few. There is a reason why I am sharing these, I swear it, just hang in there a little longer! So why share all of this? I want there to be a point to my suffering. Now that may sound a little melodramatic, but there it is. I am suffering, but more importantly, I want something good to come out of it. I want to help people. Hell, even if it is only one person, it will be worth it; to help someone understand what there loved one is going through, to help someone find a better treatment option, or to remind people that they are not alone in their struggle. If I can do that, then this chapter of my life doesn’t only have to be about pain and doctor’s visit, it can be about finding and sharing hope. So that is why I am here, in this cyber land of the matrix, writing to you all. This blog is not just for Fibromyalgics, but for caregivers, and anyone willing to read it who cares about showing compassion to their fellow man. We all know someone with health issues whether a a friend, co-worker or family member. Maybe you are a primary caregiver to someone battling a chronic or terminal illness, or maybe the ill person is you. The point is that this effects all of us, so we all need to know more. The horrible process of finding the right diagnosis, the issue of disability, medical theories and guesswork, having an invisible illness, polypharmacology and the problem with getting pain meds….these are all subjects that I hope to shed some light on, as well as some more personal experiences and probably a few corny jokes a long the way. This is my journey. This is me. I’m gonna make it count.